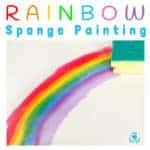 Kids Craft Room - Creative Fun For Everyone! 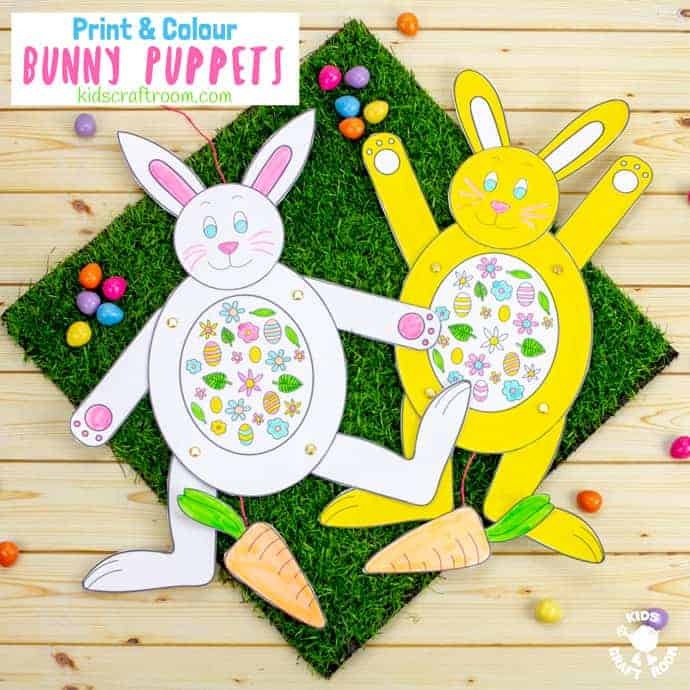 These printable paper bunny puppets are adorable! Pull the carrot to make their arms and legs move. Available in black and white to colour yourself or a full colour version. Three different ear shapes to choose from too! 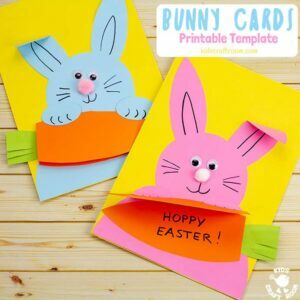 Make cute Carrot Nibbling Easter Bunny Cards with the free printable template. These hungry bunnies are adorable! 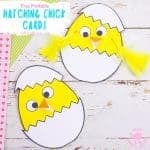 Such a fun Easter craft for kids. 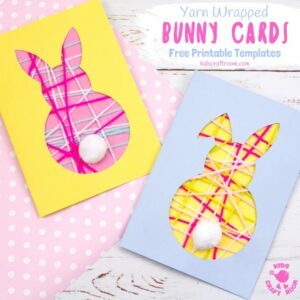 Aren’t these Easter Bunny Cards the cutest? 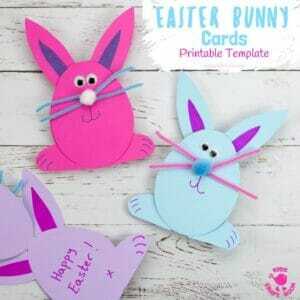 Download your printable template for some easy Easter fun! Celebrate Spring with Hatching Chick Easter Cards. 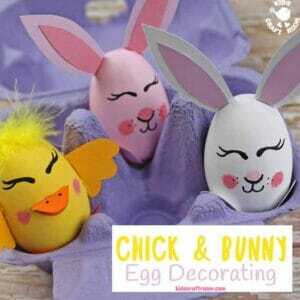 These baby chicks are adorably cute and easy to make with the free printable pattern. 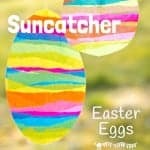 A sweet Easter craft for toddlers and preschoolers. 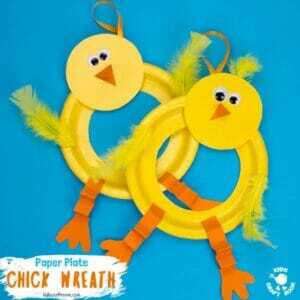 This Paper Plate Chick Wreath Craft is perfect for Spring and Easter! So easy to make and they look super cute hanging on the door! 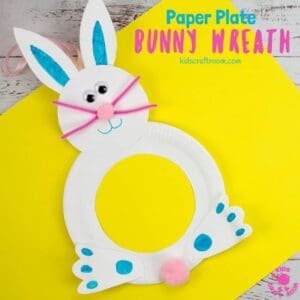 These paper plate Easter Bunny Wreaths are adorable! 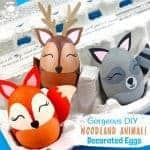 What a fun and easy Spring craft for kids. 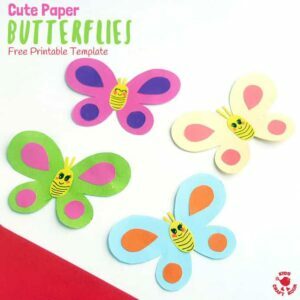 Are your kids as fascinated with the butterfly lifecycle as we are? 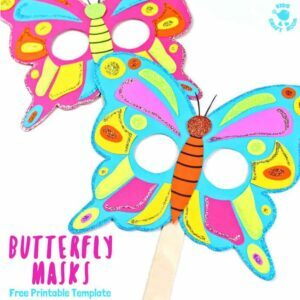 These Colourful Butterfly Masks are a fantastic way to celebrate the wonder of butterflies and engage children in learning all about them. They’re easy to make with our free printable template and a fun way to introduce children to symmetry and pattern making too. 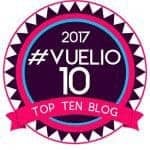 Here’s something to get you buzzing! 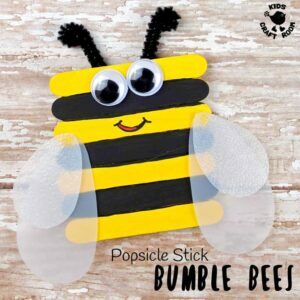 Take a look at this Cute Popsicle Stick Bee Craft. These bumble bees are adorable, with vibrant yellow and black stripes and cleverly made translucent wings they look quite the buzziness! 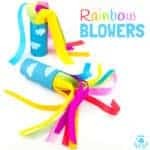 Have you tried making paper flowers before? 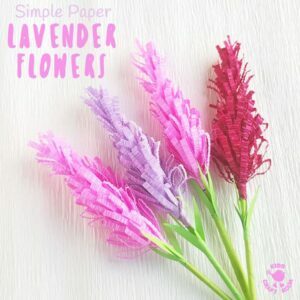 These gorgeous Lavender Flowers look so realistic and are surprisingly simple to make! 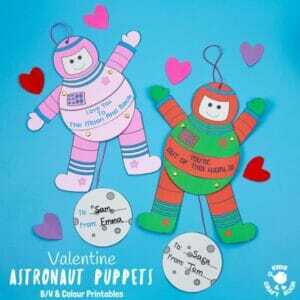 They’re perfect for Mother’s Day, to stick to greeting cards or gifts and even for imaginative play! 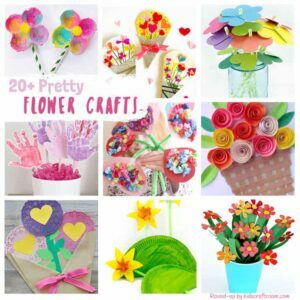 I’m so excited to share this collection of Pretty Flower Crafts For Kids, all of them are truly gorgeous! 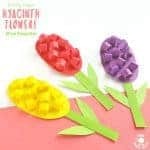 Flower crafts are a fabulously fun way to get creative with the kids in Spring and Summer and they make gorgeous gifts and greeting cards for special occasions too like Mother’s Day, Valentine’s Day and birthdays. Father’s Day is just around the corner and we have the cutest gift idea ever! 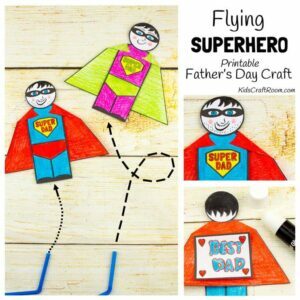 Kids will love to turn Daddy into “Super Dad” with this printable superhero craft that really flies! Wheeee! 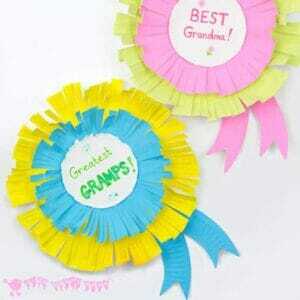 These colourful and fun Paper Plate Rosettes are a great Grandparent’s Day Craft. Every Granny and Grandad deserves to feel appreciated on their special day and will love receiving these personalised awards that they can wear too. 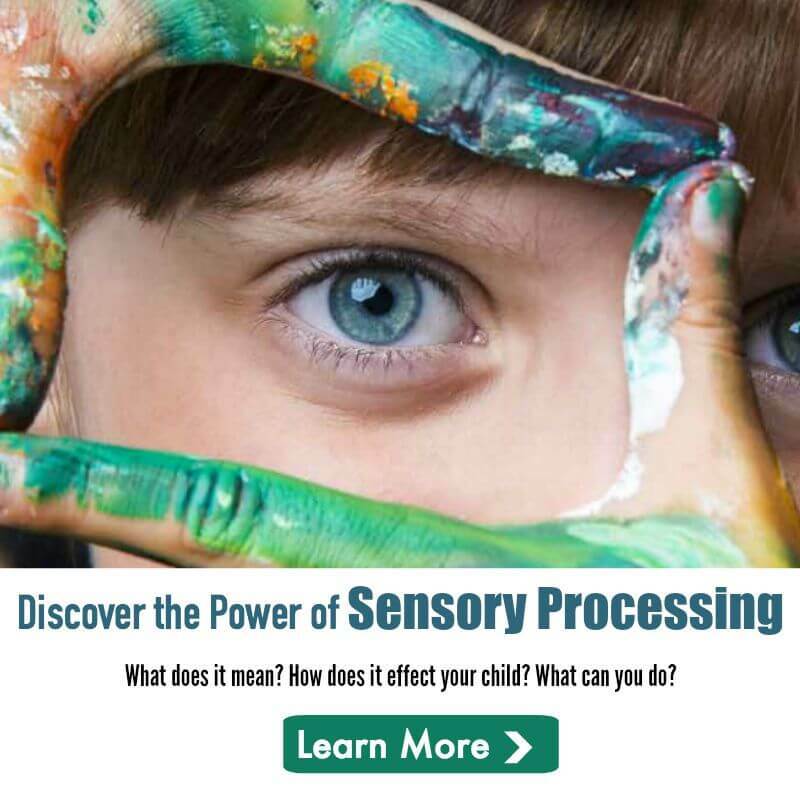 Are you thinking about Father’s Day yet? 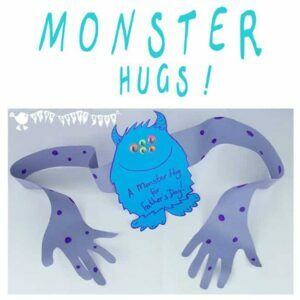 Why not let the kids make a super cute “Monster Hug” Father’s Day card. A monster hug from Daddy’s own little monster…it’ll melt his heart! 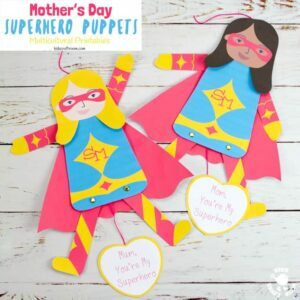 A quick and easy Father’s Day Craft for children of all ages. 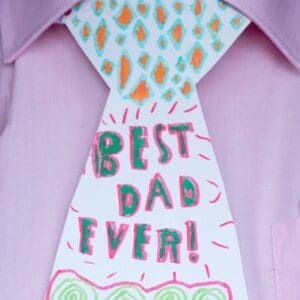 Make a personalised necktie that any Daddy or Grandad would be proud to wear. 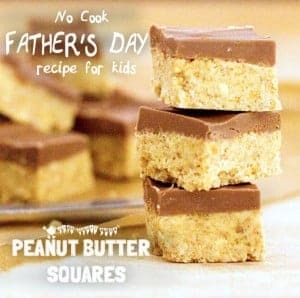 No cook Peanut Butter Squares – a fabulous easy recipe for kids and great for giving as gifts at Father’s Day, Valentine’s Day or any day! If you like chocolate and nuts then you’ll love these.